Our natural Manuka Flower Honey is harvested directly from New Zealand. This superior moisturising, natural anti-bacterial ingredient helps promote healthy, protected hair and scalp. 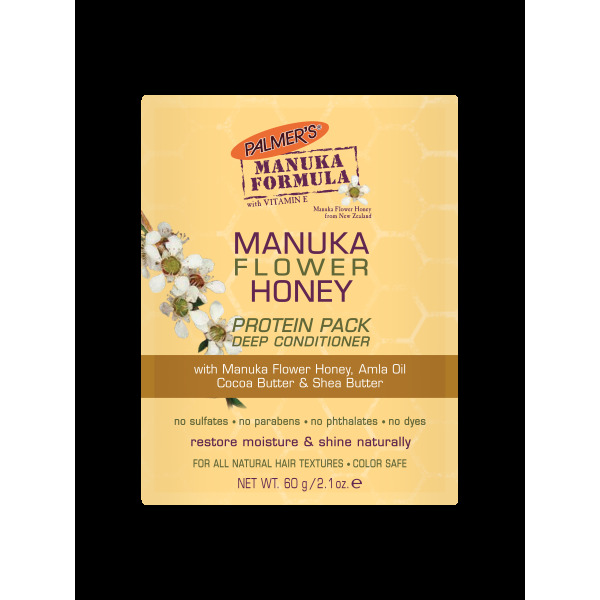 Palmer’s Manuka Flower Honey Protein Pack Deep Conditioner is an intensive deep conditioning hair treatment with the addition of Amla Oil, Cocoa and Shea Butter. Deeply moisturising treatment for dry, damaged hair. Repairs and restores brittle, breakage-prone hair. Seals hair’s cuticle for soft, shiny, healthy looking hair. 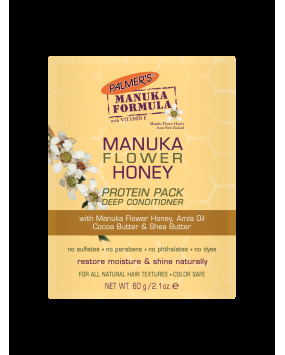 Once or twice a week, after shampooing with Palmer’s Manuka Flower Honey Strengthening Shampoo, distribute evenly through hair, focusing at the ends. Leave on for 10-20 minutes. Rinse thoroughly. Can be used as an overnight treatment.